DrumsOnTheWeb.com - Furio Chirico - Download your favorite music from drummers and percussionists! 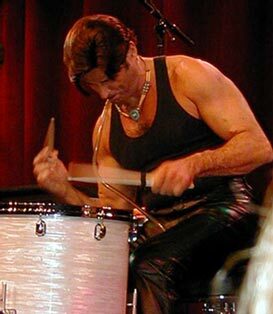 Furio Chirico has been a major figure on the drumming scene in Italy for over twenty years. (And he's still a young guy!) His powerful yet sensitive, technically head-spinning style has inspired legions of young European drummers. Furio is well known for his drumming with Italian instrumental suberband Arti & Mestieri. He also has a solo cd called Furiosamente to his credit. On it, he demonstrates his skills at just about every musical style imaginable: progressive rock, world music, jazz, funk... you name it. And he plays it all with imagination and consummate skill. This is Furio's first major US appearance, and he's thrilled to be here. We think you'll be thrilled, too. Reprinted from 2002 Modern Drummer program.